March 31, 2016 by Ecommerce News. About Mobile with tags Europe. 7792 views. Zanox, a German affiliate marketing network that’s active across Europe, has revealed some insights on mobile shopping behaviors across 11 international markets, of which most of them are in Europe. It shows that the United Kingdom and the Nordics top the list of mobile transactions, while Switzerland is at the bottom. This country however, generates the highest average order values in the online travel industry. Zanox released this data in its bi-annual Mobile Performance Barometer. Among the markets its researched are the Benelux, Eastern Europe, France, Germany, Austria, Italy, the Nordics, Spain, Switzerland and the United Kingdom. When looking at the sales development through the year per market, some signification variations become clear. Spain for example experienced a typical summer recess between July and September, while Italy doubled its sales during this period compared to March. According to Zanox this is due to a strong travel booking season. The growth of mobile sales in Eastern Europe is comparable to that of France, with a peak at the end of the year. Sales via mobile device are still increasing rapidly. “The accelerating growth rates show that the mobile market has not yet matured, but is constantly developing”, Zanox writes. It also explains that whereas tablets were the purchasing leaders in the previous years, smartphones are catching up. Most sales growth (with the results in 2015 compared to those in 2014) in a European market can be found in Spain, where sales increased by 68.8 percent. Good growth numbers can also be found in East Europe (68.7%) and the Nordics (68.3%). 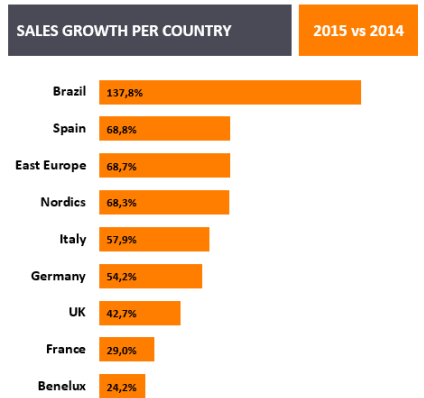 The Benelux lags behind with just 24.2 percent sales growth. Zanox also looked at mobile sales share per operating system. In Germany, iOS and Android are almost in balance (50% versus 49%), while in East Europe and Spain, Apple’s mobile operating system only accounts for 31 percent of mobile sales. But in the Nordics and the United Kingdom, iOS is the dominant OS in terms of sales, with respectively shares of 72 percent and 71 percent. According to Zanox, there is a strong preference for Android devices in countries with lover purchasing power and iOS remains the global leader in driving sales, although it’s losing share in all markets surveyed.